Exiting 2007 on a high note…thanks to all of you! With just hours left to go in 2007, I just wanted to thank all of our friends, supporters, listeners and guests one more time for making this past year such an incredible experience for me and John. Looking at our stats, the Technology and the Arts blog is at the height of its popularity…except for in March when legions of fans of both Christian Beach and Gregg Taylor/Decoder Ring Theatre stopped by to listen to their interviews and inflated our numbers drastically. However, with March being the exception, more people stopped by to visit the site in December than in any other month since we started this endeavor. So thank you so much for tuning in and reading the blog. We look forward to bringing you another year’s worth of podcasts in 2008. 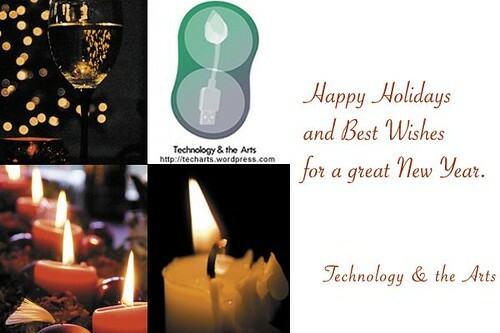 Barbara Mink, director and founder of the Light in Winter Festival in Ithaca, N.Y., discusses the annual event celebrating the synergies of science and the arts in this installment of the Technology and the Arts podcast. Other topics of discussion include year-end “top 10” lists, Christmas stories on OldRadioFun.com, the RIAA’s unfair view of “fair use,” and social music site iLike.com. Hosts: Brian Kelley, John LeMasney. File size: 15 MB. Time: 30 min., 30 sec. Barbara Mink, director and founder of the Light in Winter Festival in Ithaca, N.Y., discusses the annual event celebrating the synergies of science and the arts in this installment of the Technology and the Arts podcast. Other topics of discussion include year-end “top 10” lists, Christmas stories on OldRadioFun.com, the RIAA’s unfair view of “fair use”, and social music site iLike.com. Hosts: Brian Kelley, John LeMasney. File size: 15 MB. Time: 30 min., 30 sec. Light in Winter Festival – Barbara Mink, director and founder of the Light in Winter Festival in Ithaca, N.Y., talks about this annual event celebrating the synergies of science and the arts. This year’s event takes place January 18-20, 2008. Watch the promotional video at the bottom of this post. John and Brian reflect on one year of producing the Technology and the Arts podcast. …John is moving entirely off Windows at home and going all Linux! Brian and John once again thank Pandora, the Urban Saloon in Philadelphia and Bud Select for a great time out on Dec. 5. John talks about a recent presentation by DJ Sakuramboo at a recent Linux Users Group in Princeton (LUG/IP) meeting in which he turned a terminatorx/aldrin demonstration into a 40-minute performance. Check out David A. Harding’s blog post featuring a description and photos of the event. Since we’re in the season, try to listen to some Christmas stories on OldRadioFun.com. John searches the Internet for new pizza dough recipes, like this one…and this one. Brian takes one more shot at the Recording Industry Association of America — the RIAA, for short — in 2007, as it continues to insist that ripping a CD that you legally purchased onto your computer as a backup or to put on your MP3 player is the same as stealing music. And since we are in the final days of the holiday season, check out Ars Technica’s holiday hardware guide. Social music site iLike.com has already made it big on Facebook. Now, it plans on dominating the music scene across the entire social networking universe. Also, just to be clear, at the end of this podcast, I say that our next show will be Wednesday, January 9, 2007…obviously, I meant to say 2008. Sorry about that. While the Technology and the Arts blog celebrated its first year of existence on November 30, today marks the first anniversary of the debut of the Technology and the Arts podcast (show notes), so John and I would like to take this opportunity to thank all of our listeners, guests, friends and supporters. We truly appreciate every single person who has helped make this podcast an enjoyable endeavor for me and John. It has been an honor for us to talk to all of our guests during our first year of doing this, so we would like to acknowledge all of them in this post. I would love to get a quick interview with Todd for our podcast, but I don’t think that’s going to happen. However, that would be one cool anniversary gift! Once again, thank you for reading and listening during this past year. John and I really appreciate it. Kevin Seal, host of the “Pandora Presents” podcast and vocalist/keyboardist for Griddle. Brian Kelley and John LeMasney, hosts of the Technology and the Arts podcast, attended a Pandora get-together at the Urban Saloon in Philadelphia on Dec. 5, 2007, and had a chance to interview some of those in attendance, including: John S. James, an editor of an AIDS newsletter and a computer programmer who has an idea that may impact the online music industry; Chris McGrew, drummer for the band Griddle; and Kevin Seal, host of the “Pandora Presents” podcast and also a member of Griddle. File size: 21 MB. Time: 43 min., 55 sec. John and I would like to thank “the other” John, Chris and Kevin for taking the time to join us for interviews. We would also like to thank the Urban Saloon, Bud Select and, especially, Pandora for a really great time. Stay tuned for our final regular podcast of 2007 on Dec. 19! At the risk of repeating myself, Brian and I had a lot of fun on Wednesday night at the Urban Saloon in Philadelphia talking with Pandora users at the Pandora Presents get together. Pandora, ( http://pandora.com ) for those of you who might not know, is an online music service that allows you to log in and create ‘radio stations’ that you program to your own tastes. In Pandora, in each station, you start with a song, and as a song finishes, another song starts. You thumbs-up songs that you like, and you thumbs-down songs that you don’t. Each vote shapes the musical taste in your radio station. By voting, you also inform the Music Genome Project about someone who likes songs a, b, and f, but not g, j, or t.
The more users who vote, the more likely that the music that Pandora suggests for you to listen to (tuned by you and influenced by others who tune their stations in similar ways) is enjoyable, interesting, and surprising. They also allow people to advertise their stations to others, and create multiple stations, so I might have a lemasney approved jazz station, a rock based holiday songs station, and a drum and bass club mix. Or, I could just find others’ existing shared stations that meet those needs. They also just recently added classical music to the stations, so the music is becoming more and more diverse, just the way we like it. It’s a fun way to listen to music, a great way to find new sounds that you are likely to enjoy, and a great form of social collective work that influences on both an individual and a group level. Special thanks to Kevin Seal, the host of the evening, and Chris McGrew, for stopping by to converse with Technology and the Arts. Go, Griddle!